I’m sure I heard someone saying that this wonderful dish was the Italian equivalent of Jewish Chicken Soup. Something that is so much a part of the culture and heritage of Tuscany that no one needs a recipe and everyone has their own way of making it. Well, on my recent trip to Tuscany we were lucky enough to have a cookery lesson from Anna Bini, a lovely Italian chef with three restaurants in Paris(!). 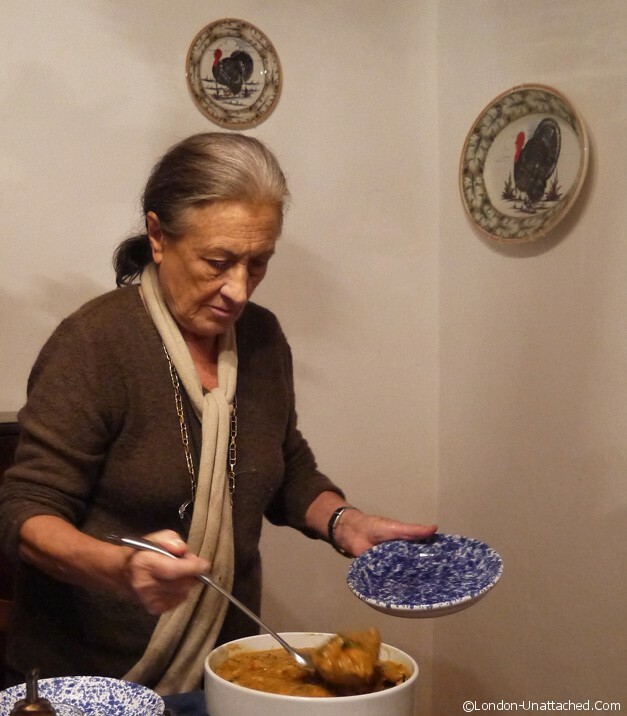 It was her wonderful Villa that Tuscany Now had offered us for this trip – and she came back to stay next door and share a few secrets of cooking in Tuscany with us. One small challenge – much of the food in the area is dominated by meat and my companion, The Hedonist, doesn’t eat meat at all. So when Anna prepared the Ribollita she explained that she’d left out the ham bone from the bean stock. And, nothing was measured, so my recipe is very much my estimate of what was used. Line an oven proof serving bowl with two layers of the thinly sliced bread and pour all the soup mixture on top. Allow the mixture to rest., ideally for a few hours or overnight, then reheat and serve. I've estimated quantities for this dish - Anna explained that most cookery of this sort is passed down through families. Anna also made a few other dishes for us including swordfish with fennel and a chestnut cake called Castanaccio. . The swordfish and fennel dish was delicious and one I will attempt to recreate at some point. 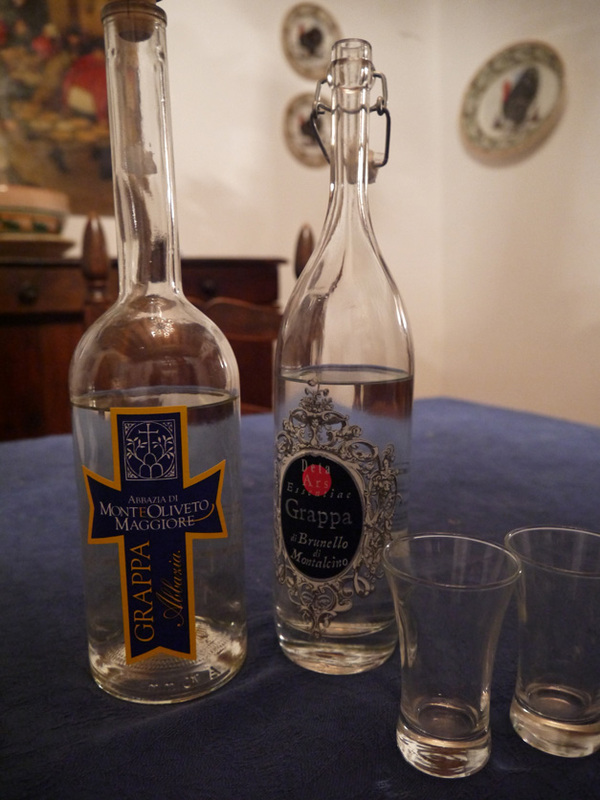 And we all sat down to a wonderful Tuscan feast, finishing off with some Grappa! Many thanks to Anna for our cookery lesson and to TuscanyNow, providers of villas in Tuscany for organising our trip to Il Monte. You are so lucky Fiona, that sounds amazing and lovely soup too! it was an amazing trip…and Anna is a wonderful woman, so vibrant! OMG! Five close girlfriends and I stayed at Il Monte for 5 days a few years ago. I got on this site to look for a Tuscany soup recipe to serve for the holidays. What a treat to go back in time! I was looking at the pictures and thought, it can’t be… BUT IT WAS! We had the most wonderful time! Anna was a joy to meet. Thank you so much for sharing. The trip we took was one of a life time! What a wonderful surprise! Merry Christmas and thanks for making mine very special! isn’t it a truly wonderful place!!!! So glad you enjoyed it too! That is lovely and really a nice way of cooking … just go for it. It was a wonderful holiday and the cookery was one of the highlights! Looks delicious! I’m with Jess though and would go with the vegetarian. No ham bone for me!